6PM: The controversial senator received a standing ovation from a large crowd when she walked into the Robert Schwarten Pavillion tonight. "Now you know your neighbour or your friend is voting One Nation so it's ok to vote One Nation"
See below for more live reporting and videos from the Bully's team at the rally. OUTSPOKEN One Nation senator Pauline Hanson is expected to address hundreds of supporters and potential opposition in Rockhampton this evening. At the request of vocal businessman Dominic Doblo, Ms Hanson will speak at a community forum in the Robert Schwarten Pavilion at the Rockhampton showgrounds from 6pm. Ms Hanson's visit comes in the wake of her maiden speech to the Senate on Wednesday night which has since generated public scrutiny, but is yet to face condemnation from ministers. 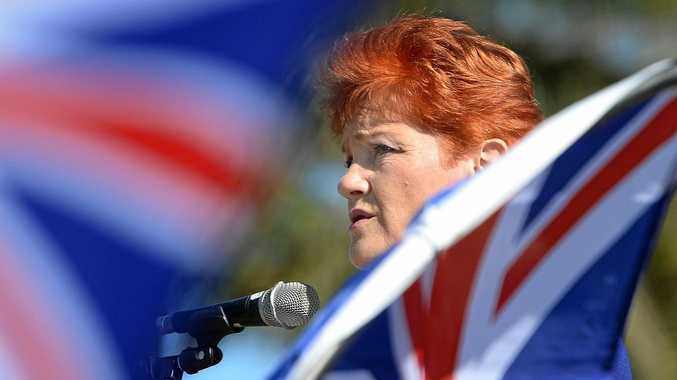 Among her inflammatory comments, Ms Hanson claimed Australia was "at risk of being flooded by Muslims" and that Muslim culture was incompatible with Australia. Domestic violence campaigner and former Australian of the Year Rosie Batty accused Ms Hanson of victim blaming following statements regarding family law. Ms Hanson said women were making "frivolous claims" and that "we will continue to see murders out of sheer frustration" unless family law is changed. An unapologetic Pauline Hanson has since come out in support of her speech, which she claims is based on fact. The controversial senator will no doubt generate some colourful discussion tonight, and The Morning Bulletin will be attending to keep you up to date.